Image by Berserkerus Some Rights Reserved. 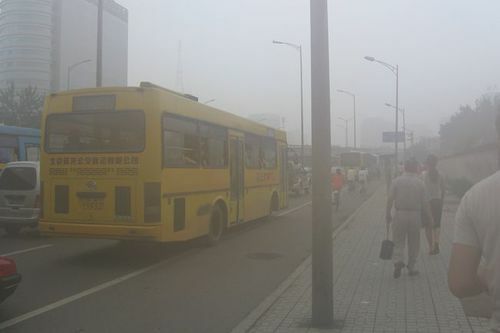 The Ministry of the Environment (MOE) released on March 28, 2014, measurements of airborne particles below 2.5 micrometers in diameter (called PM2.5, or fine particulate matter) in fiscal 2012. According to the measurements, 43 percent of Ambient Air Pollution Monitoring Stations (AAPMS) and 33 percent of Roadside Air Pollution Monitoring Stations (RAPMS) met the environmental standard for PM2.5 concentration. The environmental standard for PM2.5 in Japan is an annual mean concentration below 15 micrograms/cubic meter and daily mean concentration below 35 micrograms/cubic meter. To obtain a representative value of PM2.5 in a given area, the Japanese government generally sets up AAPMSs at sites without direct impacts from specific sources of emitting pollutants, while building RAPMSs in locations with the highest amount of residential and business activity and along roads with the strongest impacts of emissions from automobiles. At present, there are 312 AAPMSs (34 stations built in FY2010 and 105 in FY2011) and 123 RAPMSs (12 stations built in FY2010 and 51 in FY2011) in Japan, numbers that have been steadily increasing since 2010, when PM2.5 was added to the list of pollutants requiring continuous monitoring by the government. PM2.5 is generated by a wide variety of substances and their emission sources, and the mechanism of its creation is complex and yet to be fully clarified. Since so few stations have met the PM2.5 environmental standard in Japan, the MOE has identified PM2.5 countermeasures as a priority of its air pollution policies and stated the following three objectives in a policy package released in December 2013: (1) Secure the safety of citizens, (2) Meet the PM2.5 standard and (3) Share clean air with the rest of the Asian region.